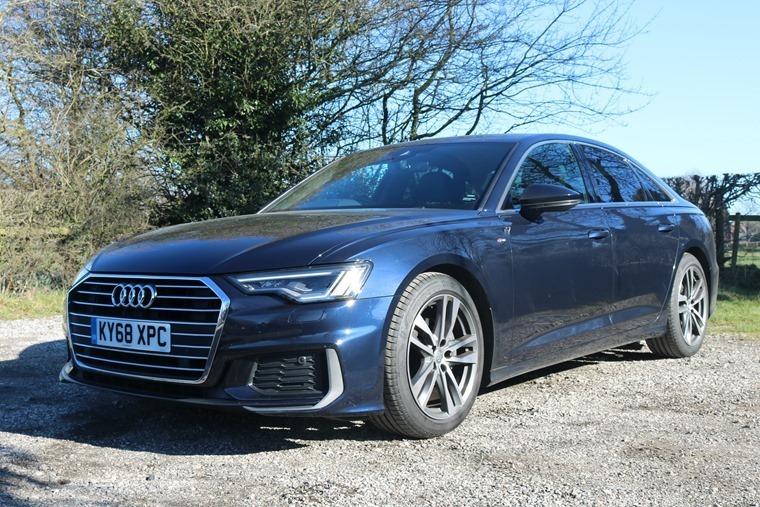 The Audi A6 is now in its fifth generation and, along with the BMW 5 Series, Jaguar XF and Mercedes-Benz E-Class, has been a go-to, large, premium saloon for years. Against those aforementioned rivals, however, the previous A6 felt like a bit of an ‘also-ran’. It didn’t have the dynamic abilities of the BMW, the effortless wafting capabilities of the XF nor the outright opulence of an E-Class. But the new one changes everything. It’s got more tech, more room and more power, while a mild-hybrid platform and tweaks to the suspension and steering take things up a gear in the engine and driving department. It’s an all-round neater package externally, even though it’s actually grown in size. Voiding the gap between the A4 compact exec and the huge A8 flagship, the A6 gets all of Audi’s latest design touches. Externally, it misses out on the full-width rear lights of the larger car, but the same angular front end looks more or less identical to the untrained eye. A huge grille now dominates the front, as it does with all the latest Audis. It’s an all-round neater package, even though its size has actually grown. Another notable change is a slightly lower roofline. It’s not exactly a swoopy A7, but it sits lower on the road than previously and offers a more rakish look. Need more proof that it’s a closer relation to the A8 than the more everyday A4? Just open the door and you’ll soon see what we mean. It's pretty much a given these days, but we'll state the obvious anyway: Audi leads the way when it comes to interiors. Glossy screens and high-quality aluminium trim abound. The flagship A8 is where the newest trim and tech can be found first, and more than a little of it has been repackaged into this more compact model. Glossy screens and high-quality aluminium trim abound in the cabin. 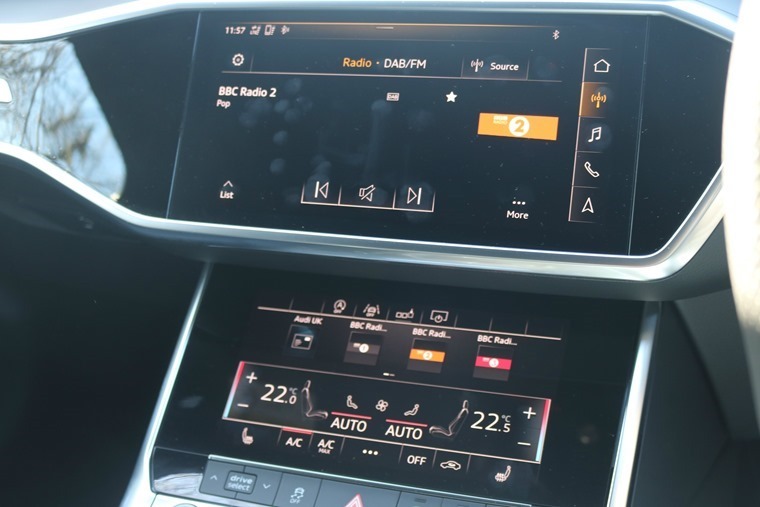 All trims feature the same MMI infotainment set-up as the A8 which, in top-spec, is made up of two touchscreens – 10.1in for the infotainment and a snazzy 8.6in unit for the climate control. Both give great haptic feedback – that’s to say they simulate touch when you operate them, much like an iPhone does. In the car we tested, these two screens are paired up with Audi’s 12.3in Virtual Cockpit display that you’ll find instead of dials behind the steering wheel. The system is generally comparable to BMW’s iDrive and Mercedes’ Command, but we can confirm it’s easier to use than the latter, at least. 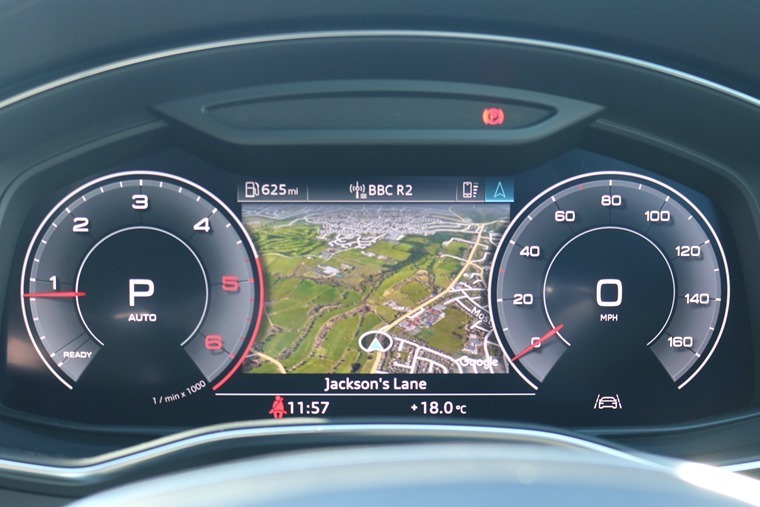 The satnav is particularly easy to follow, thanks in part to the fact you can minimize your dials and have a vivid Google Earth-like screen directly in front of you courtesy of the Virtual Cockpit. It's a clean, crisp, stand-out piece of design. Complaints? 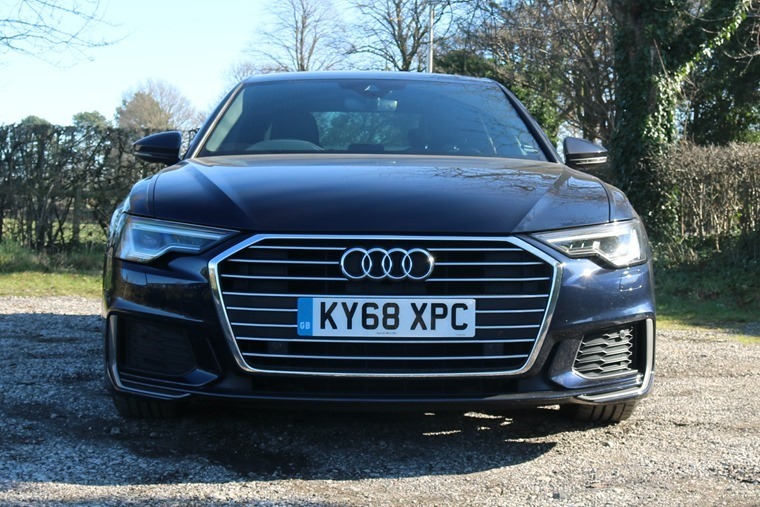 Some might find that is lacks individuality; the interior doesn’t feel as sporty as a 5 Series or as luxurious as an E-Class, but the A6 isn't trying to offer either of those things. Its focus is on offering a clean, crisp, standout piece of design. Something it does very well, even if it does it in a rather clinical way. But hey, this is Audi we’re talking about. Options are wide-ranging and very tempting, but they’re rather expensive. That larger 10.1in touchscreen and Virtual Cockpit we were talking about? That’ll cost you £1,495 – around £42 per month extra over the course of a three-year lease. Traffic sign recognition? £225. What’s worth the extra cash will depend on how you use your car, but if you cover a lot of miles, the technology pack will be worth that extra £42. Options are wide-ranging, but they're rather expensive. And space? Well like we said, the A6 has grown. A longer wheelbase allows for a 21mm increase in legroom, while a cavernous 530-litre boot will swallow a family’s luggage with ease. The load lip is flatter than before. That’s comparable with all its key rivals, and a reminder that SUVs aren’t that much more practical than a good old fashioned saloon in some cases; the latest Q5’s boot is only 20 litres larger, for example. There’s a wide range of engines to choose from, and all now feature mild-hybrid tech that aims to cut fuel costs and keep emissions to a minimum. We tested the basic four-cylinder 2.0-litre 40 TDI. It gets 202bhp and a healthy 400Nm of torque: sufficient enough to don this basic model with a 0-62mph time of 8.1 seconds and a 149-mph top speed – plenty enough for most people. It gets a seven-speed automatic gearbox, as does the rest of the range. The 40 TDI is only front-wheel drive as standard, but you can spec Audi’s quattro four-wheel drive system, while it comes standard on more potent petrol and diesels. We found the engine to be surprisingly quiet too, which only adds to the overall refinement in the cabin. For those that want something more potent, a 3.0-litre 284bhp 50 TDI is also available, but the smaller unit is so quiet and potent that there’s not really any need to go for the larger unit unless you really want a quicker 0-62mph time. Critics in the past often lamented the A6 is nowhere near as engaging to drive as a 5 Series, and they were right. This fifth-gen model has received various tweaks to the steering and suspension that give it a much more dynamic edge than A6s of old. There’s less electric steering assistance, for a start, which makes the A6 a more pleasant and natural car to drive. It’s still no 5 Series behind the wheel, but the new, lighter platform and the more direct steering make a big difference. Adaptive dampers are also available, but it’s an expensive option at £1,150. Given the vast improvements and Audi’s excellent Drive Select Mode, we’d leave that particular box unticked on your order. You’ll have to opt for the pricy air suspension system if you want to give the A6 limo levels of ride quality. Audi Drive Select lets you individually adjust steering feel and performance, while also offering an efficiency and comfort mode, too. You’ll have to opt for the pricey air suspension system if you want to give the A6 limo levels of ride quality, but the standard springs were more than up to the task in our eyes. So, want to lease one? 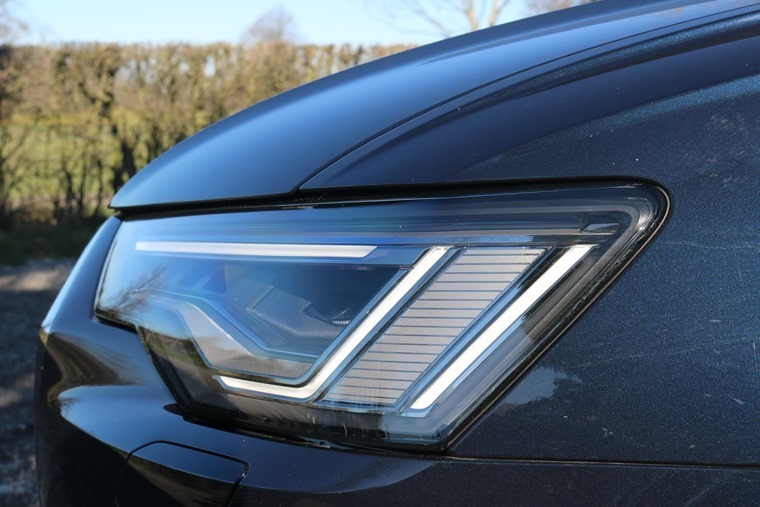 Prices for the entry-level 40 TDI Sport models start from around £300 per month, but if you fancy treating yourself to a few options and plump for the higher S-Line trim, it increases to between £400 and £500 per month. So it’s not the most affordable option then, especially when Mercedes E-Class monthly rates remain so tempting. 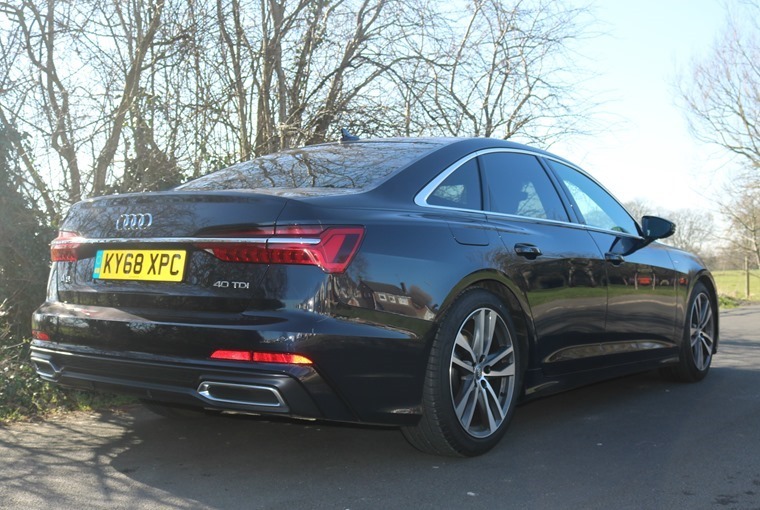 When you consider the amount of technology that has filtered down from the larger A8, it’s still an enticing proposition; keep in mind the larger car will cost you a minimum of £600 per month. When it comes to which large, premium German saloon you want though, a lot of it will boil down to personal choice. But you can now rest assured: the A6 no longer just competes with its rivals – it’s now a car that beats them fair and square in a lot of ways, too. Bigger and lower than before, all the latest Audi evolutionary design tweaks are all there, but it misses out on the full-width rear tail lights of the A8. Exquisitely put together as always, but it’s the tech and those beautiful touchscreens that really impress. It’s never going to beat the 5 Series, but the engineer’s efforts haven’t gone unnoticed with suspension and steering tweaks providing a much-improved on-road experience. 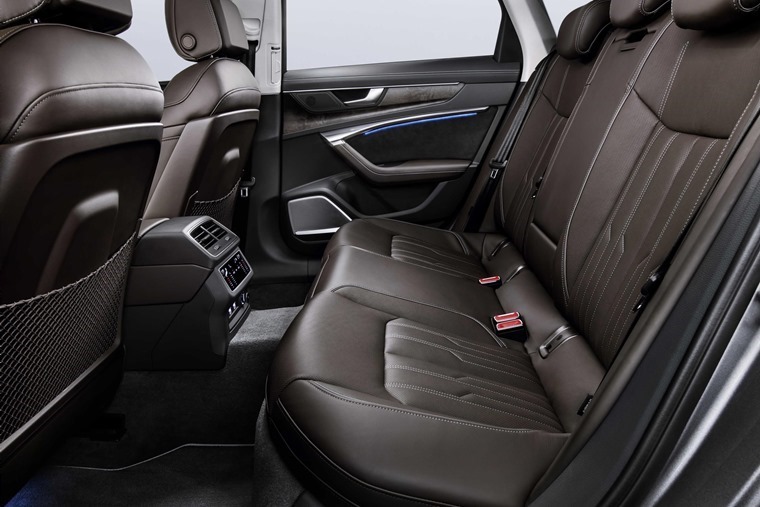 There’s more rear legroom courtesy of a longer wheelbase and a boot that will make you wonder why SUVs are so popular. Mild-hybrid drivetrains are standard across the range, and we averaged 44mpg in the 40 TDI over a range of driving conditions.